Westerners Aren't Good At Naming Smells. 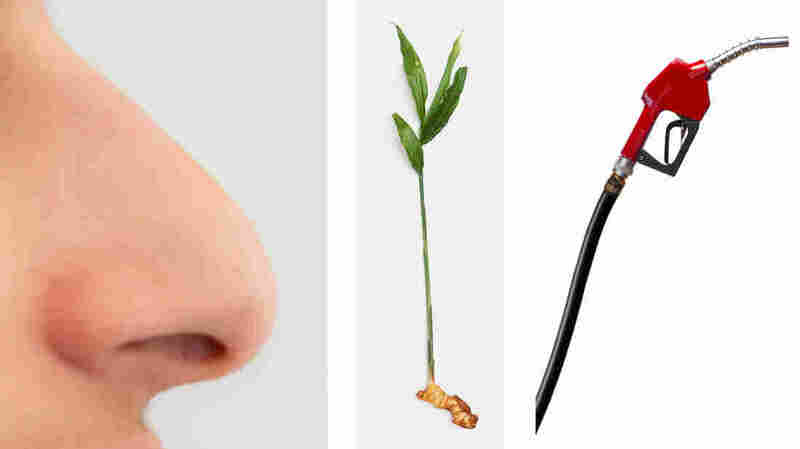 But Hunter Gatherers Are : Goats and Soda A new study looks at the way we identify smells. English speakers kind of stink at it. But that's not the case in every language. When you smell ginger root or petrol, do you have a specific word to describe the odor? A strange smell had invaded my apartment. It was sour and pungent like rotting meat. Or maybe it was more like old fish. It was kind of like both of those things with a hint of spoiled milk. If you have no idea what I'm talking about, blame the English language. It's not just me; it's very difficult to describe scents in English. It's hard to do in German and Dutch and French, too. So why aren't Westerners good at naming scents? For decades, scientists thought perhaps smell was a diminished human sense and less valuable than other senses — like our glorious eyesight. "In the West, people came to this conclusion [through] the fact that we don't seem to have a good ability to talk about smells," says Asifa Majid, a professor of language and cultural cognition at Radboud University in the Netherlands. But Majid found that isn't universally true. Certain language speakers can name odors as easily as English speakers name colors, and the key difference may be how they live. Majid has worked with speakers of four different languages: English and three from the Malay Peninsula. Two of these languages, Semaq Beri and Jahai, are spoken by hunter-gatherer groups. The other one, Semelai, is spoken by farmers. In order to test the ability of these language speakers to classify odors, Majid and her colleagues gave asked them to smell pen-shaped contraptions each filled with a different scent like leather, orange, garlic or fish – and then asked them to identify the smell. She also asked the participants to identify colors using different color chips. The farmer Semelai, like English speakers, found colors relatively easy to name and agreed with one another that the red chips were, indeed, red. When it came to identifying odors, the Semelai failed as miserably as the English speakers on the same tests. But both hunter-gatherer groups were much better at naming smells than the Semelai. In fact, they were just as good at identifying smells as colors. "That says something about the hunter-gatherer lifestyle," Majid says. There's a scarcity of English words that objectively describe odors, Majid says. Given that, readers of this article — written in English — may wonder how it's possible to describe a smell without leaning on other senses like taste (words like "sweet" or "sour") or emotional words like "gross." "The closest word we have is musty," says Majid. "Musty picks out a quality of smell that we associate with a room not opened in a long time or books or different scenarios." When we say "musty," we don't mean old rugs or dusty attics. The word is describing some abstract character of those fragrances. In English, most of our attempts to describe smells come from individual sources. You'd say, "That smells like fresh laundry" or like a wet dog. This may seem OK to you, but it's akin to describing a red brick by saying, "Well, it looks a little like rusted iron. But it also looks kind of like the setting sun." And I would say, "What?" The Semaq Beri and Jahai don't have this limitation. They have an arsenal of words like musty that can describe odors just as a color word can describe objects — the word red, for example, can describe rose petals or the lunar eclipse or dust from the Australian desert. This may seem a little confusing to us non-hunter gatherers. But think about it – "rancid" describes an attribute that an odor has but doesn't uniquely match a specific odor, like, say, old peanut butter. "The Semaq Beri, like the Jahai, use abstract color words, but they also have abstract smell words they use for different qualities of smells," Majid says. For instance, the Jahai word Cηεs describes the seemingly dissimilar smell of petrol, smoke, bat poop, root of wild ginger and wood of wild mango. To the Jahai, all these scents have this quality of Cηεs. The team's study is published in Current Biology on Thursday. The study co-author is Nicole Kruspe of Lund University, Sweden, a linguist who is an expert on the local languages. Hunter gatherers might have this lexicon because they, especially those that live in a densely vegetated areas as the Jahai or Semaq Beri do, rely heavily on senses other than vision, says Jonas Olofsson, a psychologist at Stockholm University and a smell researcher who did not work with Majid. "You're going to have to detect food, predators, animals, roots and vegetables in a context where you can't really rely on your vision because it's a dark, dense forest." When certain humans gave up hunting and gathering to settle, build cities and farm, odors might have become less important to survival. "We have to have a concurrent need of some kind and opportunity to use that vocabulary to keep it alive," Majid says. Without the need to describe odors for survival, those words might have dwindled away. Whether the results suggest that our sense of smell is not as limited as previously thought is also up in the air, Olofsson says. If some groups are able to describe colors and smells equally, then perhaps our eyes aren't better than our noses after all. "Or on a more general level, it tells us that given the right environment, humans might overcome the challenges physiological architecture puts on olfactory language," Olofsson says. The work doesn't necessarily mean that hunter-gatherers are better at smelling than farmer-types — just as you wouldn't say that someone with 20/20 vision is better at seeing than someone who needs corrective lenses, Olofsson says. It might simply mean that those of us who live in environments where you don't need to know odors to survive can still smell just as well — but don't have the ability to easily communicate olfactory experiences. So you probably still don't know exactly what that stench smelled like in my apartment. And I'm still not sure if I can put a name to it.